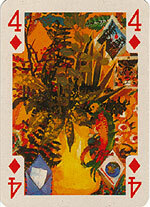 These are examples of playing-cards not intended for play. Each of the pip cards have been changed (transformed) by the addition of drawings that include each of the pips as part of the picture. The result can be artistic or humorous. These cards became fashionable in the early 1800s, and interest in them has revived from time to time. The standard reference book on Transformation Cards is: Transformation Playing Cards by Albert Field, U.S. Games Systems Inc., Stamford, USA, 1987, ISBN 0 88079 033 4. This work confines itself to commercially printed packs only. Examples of transformation cards are shown in the gallery below. All of them use a normal, French-suited 4 of diamonds as a starting point. Some are commercially printed, others are hand-made packs by artists. Some of the artists "cheat" by allowing the pips to move from their original position. Click on a card in the gallery below and it will be displayed in the column on the right-hand side with a description. "Art for the Earth", 1992. Each card designed by a different artist.